It's the 25th death anniversary of Sen. Ninoy Aquino. The lunch after the Mass was in a gated community and when we got to the house, we saw bodyguards and security people. By the time we got to the door (we're the first of the artists who arrived), we saw senators, congressmen and former cabinet secretaries. And Noynoy was greeting people by the front door, invited us inside though he doesn't know us. We panicked. But we got in and at the foyer (they have a huge foyer with garden), we called Gerry's contact there, Jiggy, who's Cory's eldest grandson. It was sort of embarassing because it's like gatecrashing at a private party for family and friends, because that's who are inside. The reason Gerry was invited, along with other artists, was because he contributed to a book, a tribute to both Ninoy and Cory by their grandson. It was a collection of 25 artworks and 25 essays. Me, I tagged along because I wanted to meet Cory. 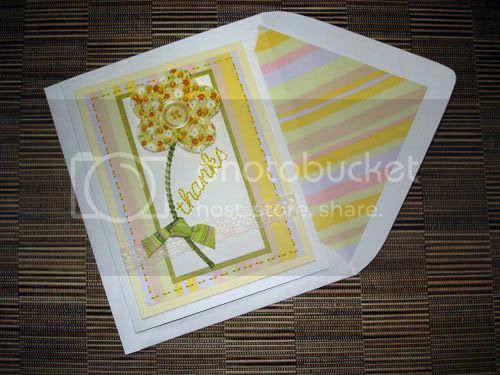 I even made a card for her thanking her for being an inspiration. I told her that her quiet strength, courage and spirituality made a great impression on me as a teenager. 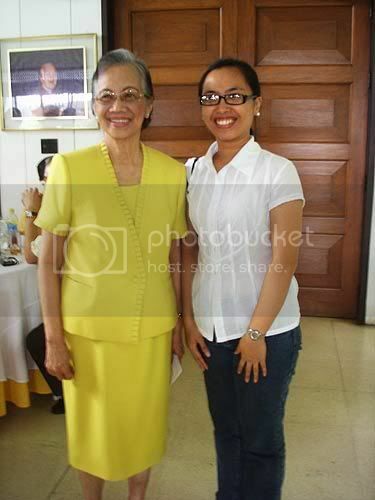 I was sitting beside a very nice lady who I later learned is the wife of a former Education Secretary under Cory. She and her friends regaled us with their stories about protecting the ballots during the 1986 Snap Election when they thought they really won't survive that year. She even got my number in case she'd want to have something done in terms of invitations or albums and what-not. She interviewed me when it should be the other way around. These people are nice! Then people started to leave. Jiggy told us that he'll introduce us to his grandma before we leave. Each one of us had our photo taken with her. She's directing the photo shoot, it's funny. "No flash? You? Why don't you want your photo taken with me? No camera? This one is good, c'mon?" Then she went out. We thought, she left for real. The artists started having each one sign their books. Then Cory came back alone and sat on the table where Gerry and I was sitting. She told us a cellphone anecdote that's really funny. hehe. We talked about comics. She told Gerry and I that she asked Jiggy where did you meet these artists? Justin told her, because of comics. She said these in Tagalog, "but you're old enough for comics!" And he said, "Lola, comics now are different." And she told us, almost apologetically, "Well, I went to the States at 14, I only knew of Archie." I can't do that... what you did!" She told Gerry, referring to the likenesses of Ninoy in the book that the artists did. So I said, but you're also painting. "Yes, I do but that's different. No matter how hard I copy what's in front of me, I really can't." Then I said, "but that's your interpretation." "Not even an interpretation." And she's laughing. She told us that she gave away her paintings as gifts and told the recipients not to sell them. "Maybe when I'm dead!" She laughed. Then we asked for one last group photo, and she said, "That's too much!" But she's smiling. She's probably tired already but she still accommodated us. What's great about the meeting was, she's exactly the person I thought and imagined her to be for more than 20 years and that's just awesome!